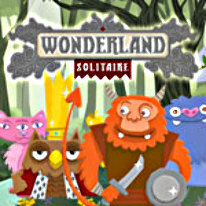 Save Wonderland in this unique game of solitaire. Welcome to Wonderland, a mysterious land of magic and legends. The king has died and the fairy prince, Argon, is the people’s choice to succeed him. But the evil sorcerer Rasmos has other ideas. He’ll use all his dark powers to take the throne. Summoning a magic whirlwind, he scatters all the creatures gathered to elect the next king to the ends of the four winds. Who will vote for Argon now? Prepare for a fascinating adventure in this one-of-a-kind game of solitaire. Explore Wonderland, buy upgrades in Ye Olde Magik Shoppe, build a deck of wonder cards and use your wildcards carefully to rescue victory from defeat. Are you clever enough to save Wonderland?